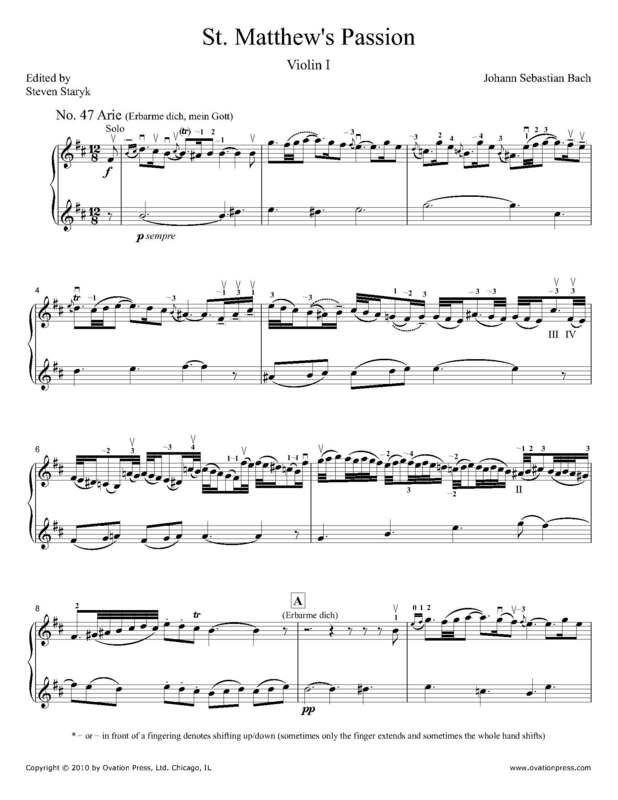 This violin excerpt containing the solo from Arie 47 of Bach's St. Matthew's Passion, BWV 244 has been edited by Steven Staryk, renowned musician who has held the concertmaster position with some of the top orchestras in the world, including the Royal Philharmonic Orchestra at the age of 24 (the youngest ever), and earned the title "king of concertmasters" from The Strad magazine. Staryk's bowings, fingerings and other editorial markings have been added throughout the score. St. Matthew's Passion is a sacred oratorio written by Bach in 1727 which sets the Biblical text of Matthew 26-27 to music, with interspersed chorales and arias. While many composers wrote musical settings of the Passion during this time, Bach's is distinctive for his use of a double-choir format and extensive use of chorales, which appear in standard four-part settings, as interpolations in arias, and as a cantus firmus in large polyphonic movements. The violin excerpt here includes the solo from Arie 47 (Erbarme dich, mein Gott). Download and print the score today to gain access to expertly edited Bach St. Matthew's Passion violin fingerings and bowings for the Arie 47 excerpt from Steven Staryk! Please note: This score is an excerpt containing the violin solo from Arie 47.